Last week I shared behavior maps created by School of Visual Arts (SVA) students who observed the behaviors of people and non-human animals in Washington Square Park. I am so excited to share another set of four maps with you. These maps were also created by SVA students. Sneha, Nga, Hanna, and Dami designed sensory maps of the park. 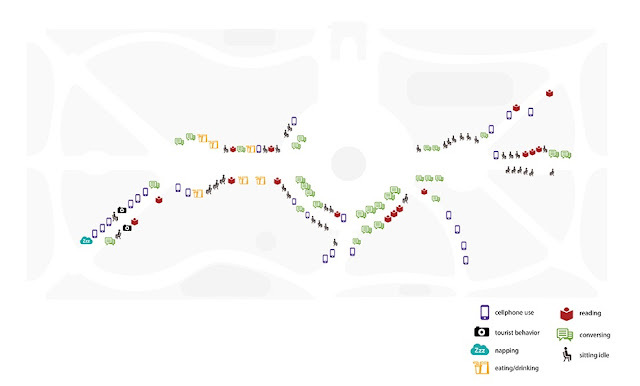 A sensory map is a vehicle to "show how people use their different senses to navigate a city," writes Duncan Greere in his article about Kate McLean's incredible sensory maps. 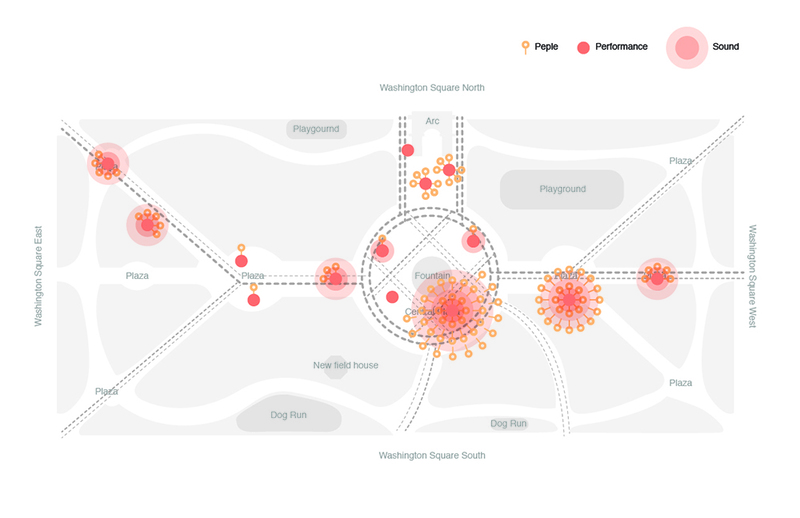 The SVA student maps of Washington Square Park illustrates how they sensed the park in mostly auditory terms but also emotionally. 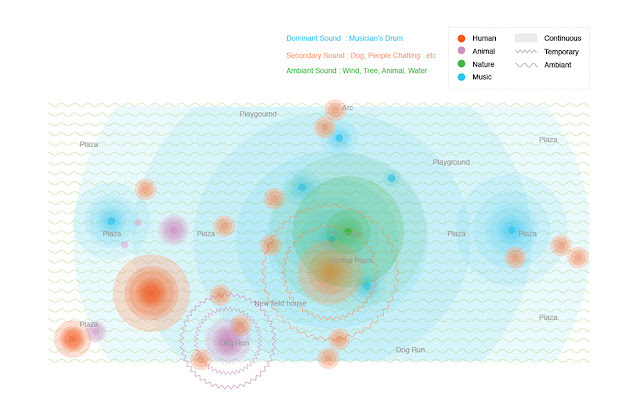 The first map captures three types of sound and their temporal states. The second map uses nine emotional states to describe the park. 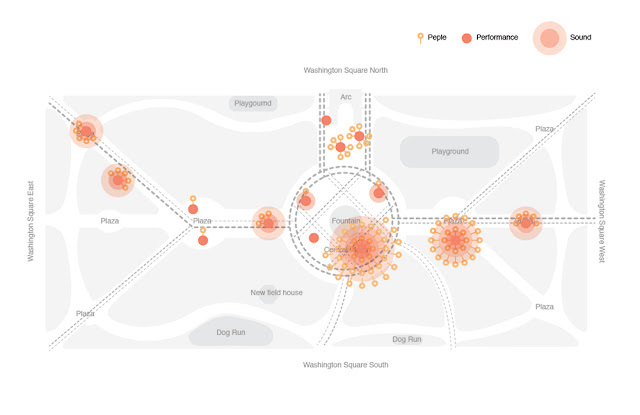 The third map also represents sound but focuses specifically on performances and the density of the audience. 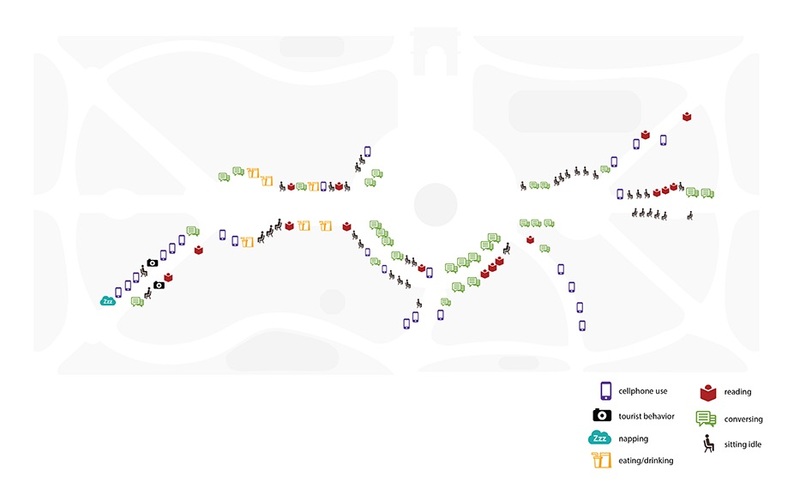 The fourth map resembles a traditional behavior map in that it categorizes how people are using the park, but taken from a different perspective, the map could be conceptualized as chronicling the ways in which users are actually engaging or not with the park. So what do these maps tell us about the park? Music is a dominant auditory force in the park. The impact of natural sounds is centered on the fountain. The power of children's laughter is noticeable at the mounds but insignificant at the other two formal playgrounds. 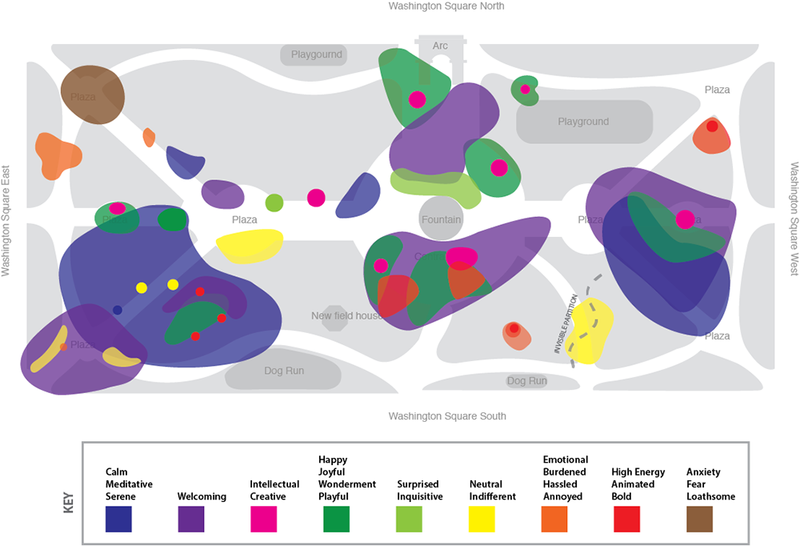 The mounds are welcoming and associated with happy and joyful emotions as shown in the Emotional Map. On the opposite end of the spectrum are the emotions "anxiety, fear, and loathsome" which are generated when in the northwest corner of the park. Have you felt these emotions when walking through this area of the park? The performances near the fountain and in the eastern half of the park generate a lot of spectators. Finally, it's nice to see a healthy mix of recreating in the park -- napping, eating, reading, talking, simply sitting -- as depicted in the Sensorial Map. I'd love to hear what these maps say to you! To Sneha, Nga, Hanna, and Dami, thank you for making Washington Square Park the object of your study. Your rich observations tell many stories about this beloved park. Thanks also to Michael Luck Schneider, faculty at the School of Visual Arts.